Swift HR Solutions Celebrates a Happy 15th Anniversary! Fifteen years ago, Swift HR Solutions was born (a month after Facebook). As with many who start a business, Shannon Swift might have been considered irrationally optimistic. Looking back, she had good reason to be optimistic. She proverbially shouted out “HR is not boring. HR is about more than rules. HR can be an integral part of success.” Experts raised their hands to say; “I want to be a part of that!” and joined the team. Each year awesome customers left inspirational reviews that inspired the Swift HR Solutions team to do more. This fifteen-year anniversary is very special considering how difficult it was during the great recession. It took a serious commitment (and again, maybe a little irrational optimism?) to continue the mission. When it was announced that Swift HR Solutions made the Inc 5000 Fastest Growing Companies List, it became apparent that it was not “irrational” to be optimistic as it recognized the talents and commitment of the “Swifties”. I don’t even know where to start. I’m trying to remember who met you first - If it was Diego or me. Diego was working for Taecan.com in 1998 and I was working for LifeSpex. You and Molly were at Trinet. It is such a small world – and that we continued to follow each other through our careers. We met up at HR roundtables, both at tech companies – me at CapitalStream and you at Goahead. I remember the SHRM conference with Kathi Jones – so many laughs. I remember us wearing long floral skirts and Kathi telling us we needed to dress it down . The many years of friendship and laughter. You were my friend and mentor when I needed one during the good times and bad during the crazies at CapitalStream. Then, when you started “Swift HR Solutions”, I remember you calling me and telling me, “hey, I have this box product I want you to look at with me!” And you were off and running. Since that day I took you to lunch years back, I have worked on every Swift HR business line. I love SwiftHR and all things SwiftHR. I am so happy to be celebrating 15 years with you as a Swifty. I would take up too much space to list all the things I have learned from Shannon Swift. I remember just driving everywhere with you my first year and watching you and learning from you – just as I continue to today. We do have fun – don’t we? And then, WE MADE THE INC 5000! Such a sweet surprise and there are only good things to come for Swift HR Solutions. Thank you for putting your heart and soul into this business. We all love appreciate and you so much. 💗 Congratulations and Happy 15th Anniversary to us! After our first meeting at Purple in downtown Seattle, I knew that I have found a great fit. I remember thinking, "wow, finally, someone who gets the way I practice HR!" Once we started reviewing some of the SwiftHR-in-a-Box documents and how the approach to client matters, it was like I was reviewing my own style of work! I could not believe the alignment! Shannon supported me with my first client. Shannon took the lead on planning the communication and schedule for the day. Once again, I was sitting there, so pleased with my decision to join SwiftHR, because her entire communication plan and scheduling approach mirrored my approach during my career. I am so grateful for the opportunity to work for Swift HR (and Shannon! ), for almost six years. I have not only grown tremendously in my profession, but also continue to increase my abilities and strengths. I first saw you at a Lake Washington SHRM meeting back when you were President, and I just loved your energy! Somehow even though you looked like what I called a fancy Eastside HR lady, I knew you were also cool, friendly, and down to earth. Little did I know then that I would have the opportunity to work with you. Some years later, we connected over lunch to talk about your awesome SwiftHR-in-a-Box idea. When Melanie talked to me about joining Swift HR Solutions in 2015, it was clearly meant to be. I have felt tremendously lucky and grateful ever since. Your energy, humor, positive attitude, integrity, undying support, generosity, and love of people never cease to inspire me. I truly can't think of a better way to top off my HR career than to be a part of this amazing team that you've built, nor a better way to spend the last half of my life than to call you a friend. Thank you for everything you do. I love you!!! Thank you for building an amazing company and for everything you do for SHRS. Your tireless dedication and effort are appreciated every day. You are an inspiring leader and your integrity and values are admirable. Your continuous positive energy always amazes me, and I have learned so much from you. I always appreciate your sense of humor and optimism even during tough times. I have truly enjoyed working with you and our team over the years and I’m so proud to be a Swifty. This has been a wild 15-year journey and I look forward to many more years of success! Thank you for being you and for all your support over the years! Happy 15th Anniversary!! I remember networking with Shannon when I was trying to decide next steps after leaving BSquare a little over 14 years ago (after being in house for 20 years). We had known each other for years through the High Tech HR Roundtable, but had never worked together. She had just formed her company a year earlier, and was looking to bring on her second consultant after Molly Fitch. She asked me to join the team. I said “Yes!” and never looked back. It has been an incredible ride working with fabulous companies and wonderful colleagues! I thank Shannon for having the courage and smarts to make it all happen! I met Shannon in the late 80s when she was working for a company in the healthcare industry (sorry I don’t remember the exact name of the company). I was working for Manus Temporary Services and I called on Shannon as a potential client to order temporary workers from Manus. I can still picture calling on her when we were both still babies – haha! Through the years I have known Shannon as a fellow HR professional and friend. Our paths crossed frequently in the 90’s when we were both very active in the Lake Washington chapter of SHRM. And then we were both part of an informal investment club of women during the early 2000s, seeking a broader understanding of the investment world. We had a great time researching stocks, drinking wine 😊, and enjoying the company and fellowship of other like-minded women. I was very happy for Shannon when she started Swift HR Solutions and it flourished from day one (even through the 2009 recession). Shannon and I talked about the potential for me to become a Swifty a couple of times and at first I wasn’t ready to give up the in-house world. Once I made up my mind in 2014 that I was ready, I have never looked back! What a great journey it has been since that very first meeting way back in the 80’s. I am very thankful for Shannon as a powerful business woman, leader, entrepreneur, friend, ally, and incredible human! Thank you, Shannon, for creating this wonderful opportunity for all of us that make up the Swift HR family. I met Shannon is late summer/early fall 2006. I learned of her from Artie Buerk, of Buerk Dale Victor, who told me that if I wanted to do HR consulting the only person I needed to talk to was Shannon Swift. That’s really all he said. I don’t remember whether he introduced us or whether I contacted her directly. But we met at the Starbucks on 2nd at Madison I think, but it’s not there anymore. What I remember is that this petite ball of energy came tearing into the Café, talked a mile a minute, told me she was going in-house with some company called Zillow, had more business than she could handle, loved working with small tech companies and that she lived in a place called Lake Joy. I was overwhelmed by and in awe of her energy…still am…and I’m sure she asked questions that were applicable to determining whether I was someone who could be part of and represent Swift HR Solutions, but I don’t remember. She flew out of the Starbucks as quickly as she had flown in and I left rather unsure of what had happened. Sometime later I learned that she had contacted my former boss at Cornerstone Advisors, and I think also, my supervisor at the City Prosecutor’s Office, and wanted me to meet with Caprice. And then there was radio silence. But in early 2007, Shannon called and asked if I wanted to start and my first client was a high-networth family, so right in alignment with my background. And that was the start of our work relationship and our friendship. The other Shannon story was when she called me about a client that was a very large company, but again, family owned, with lots of dynamics and challenges and it sounded like a great growth experience. Shannon then said it was in Wenatchee. Ok, that’s fine. But, where is Wenatchee? Shannon has thus facilitated not just my professional growth, but also my knowledge of Washington state outside of the Puget Sound. Thank you for that! I can’t highlight just one interaction with Shannon that supports my belief that she’s an amazing leader and an inspirational presence. Every time I interact with Shannon, from the first “so you think you want to be a Swifty” meeting, to our Swifty events, to each Friday’s Swift Scoop, I am reminded that she’s the embodiment of the Swift HR Solutions values. The one that comes to mind most often is Win, Win, Win. Each time a challenge comes forth, whether personal or client-related, Shannon faces it with courage and an eye towards mutually appealing outcomes. When a client becomes untenable, she supports a graceful exit or a regroup to make the relationship work. And when one of us is faced with a personal challenge, she’s there with kind words and actionable support. 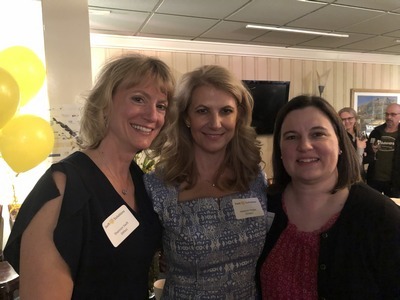 Being part of Swift HR Solutions and having the opportunity to work with Shannon has made my professional life a true “Win, Win, Win,” and I’m forever thankful! You are the “knightess” in shining armor that rescued me from the prison of corporate servitude! I have NEVER felt so professionally satisfied and now know my career path was always about THIS destination. Thank you for every risk you took to grow this business into what it is today; an army of awesome professionals I’m forever grateful to be a part of. Know you have made a profound, positive difference in my life. Something I like about being a Swifty: I love that I know I’m backed up. I always know that as long as I approach something with integrity and our values, I have Shannon and the entire team behind me. It’s a great feeling to know that we have such an amazing group. 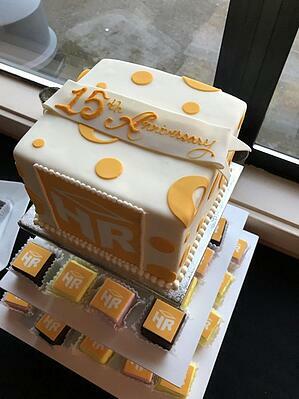 Happy 15th Anniversary to Swift HR Solutions!! I had not been a Swifty but for a couple of months and we were all invited to Lake Joy for the annual summer picnic. (This was August of 2016, I believe.) I had no idea what to expect but was soon to learn what a treat it was! First, I wasn’t sure where we were headed. From the invite, I had not deduced that we were going to Shannon’s home. For some reason, I thought maybe it was a conference space or a resort on a lake in the woods. We brought our three children, bathing suits, and because I don’t like to ever come empty handed, I brought a fruit salad to share. To be honest, I was nervous. With the three kids, usually they all want to do three separate things and in three different directions. And, as our youngest has Down Syndrome, you have to keep a close eye on him. Following the signs through her gorgeous front garden, which we spent probably an extra 10 minutes exploring with the kids, we made it to around the back of the house. Shannon saw us coming right away, ran straight over and gave me a hug. She immediately put me to ease. She introduced us to her husband, daughter, and the family dog and started explaining where everything was and all the fun things for the kids to do. My kiddos were so excited and enamored with the tree house, they made a B line straight for it. They spent most of the afternoon there, playing, eating lunch, and bringing things up and down in the bucket conveyor system. They had a BLAST!! And, for me, it was a nice relief to know where they all were and that they were safe. After a delicious catered meal (and my fruit salad!) we boarded their pontoon boat for a trip around the lake. It was so gorgeous, so relaxing, and Shannon had arranged an informal ‘meeting’ and moments of gratitude and stories about each Swifty. I remember thinking, I have never had an experience like this and I’m so lucky to have found this wonderful group of smart, talented, and like-minded people. On the way home, the kids feel asleep, happy and tired from a fun-filled day at the lake. My husband and I were chatting and I remember telling him that I think I’ve finally found an organization and a leader that ‘gets it’. For Shannon to open up her home to everyone so openly and generously, it goes above and beyond in my book. We have since returned to Lake Joy every summer since then and look forward to this annual event. The next year was a fantastic scavenger hunt with gifts for everyone and the following year was a hotdog food truck! Shannon really knows how to throw a fun-filled, family-friendly extravaganza!! She truly is one of a kind and she has built something that is like no other! Happy 15th Anniversary to Swift HR Solutions!! I know I haven’t been a Swifty for long but what I really appreciate about Swift HR Solutions is that it always feels like how we work together allows the business to flow at exactly the right times and we always seem to have the right people for what the clients want. Happy Anniversary and hugs to all! My absolute favorite memory of Shannon is when I called to tell her about going in-house at a company. I was a bit torn because I love being a Swifty and I loved the new company. She made the conversation so easy. She gushed with positivity; told me how lucky the new company was to have me and ended by saying that she would leave the door open… just in case. Four years later and here I am! I met Shannon when she was the head of HR at Go Ahead Software. I knew from the roundtables and conversations with her that she was something special. This was reinforced when my friend Lori told me she was working with the best boss ever...and it was Shannon! To this day, she still says that. I was fortunate to become a colleague, and even more grateful to become her friend and play at Lake Joy and go see Carbon Leaf at Kerloo Winery. Shannon, you bring sunshine and light into every room you enter. Thank u for being u. Cheers to 15 more! I remember meeting and hearing you speak at a HRRT event YEARS ago, and I remember thinking: "WoW! She gets this people stuff!" Plus, you had such a presence up at the podium! I am honored to work with, and for, you. I always feel so proud when I say, "I'm a Swifty!"